The most important thing to know about Boogiepop is that the plot utilizes changes in perspectives and very subtle clues. This can make it difficult to follow the nuances of the world and plot without some effort. It's not light viewing. Once you begin to understand the ways in which the characters are connected, along with the incidents they are connected to, it begins to unfold. The story is dark, and while they don't usually focus on gore directly there are violent scenes and images that make it not for the squeamish. The original anime series aired almost 20 years ago now (in the year 2000), and that anime was a masterpiece, albeit a complex one with alternate perspectives and a non-linear progression of the plot. This offering is also relatively complex. Drawing and animation are good, but not amazing. Boogiepop and Others is a prequel to the 2000 series, Boogiepop Phantom. If you're not well versed in the Boogiepop series, the storytelling is a little different than what you'd typically see in anime. Where most anime focuses on a linear story, the Boogiepop series features a non-linear story. Where Phantom served as an animated continuation to the first LN, Others IS the first LN - the very LN most famous for popularizing LNs in Japan. Every single episode of Boogiepop and Others tells the exact same story, however, you're seeing it from a different character's perspective each episode - you get to experience and feel each characters' individual emotions and thoughts as the event unfolds. The first episode sets up a very basic timeline of events as seen from one character, and every episode after that fills in this timeline with more information as seen from different characters. As such, you're going to see the same scenes throughout multiple episodes, but from a different point of view. It's a narrative based anime that encourages the viewers to piece together the full picture by connecting the dots from each characters' perspectives. If you're a fan of supernatural mysteries and criminal psychology, Boogiepop and Others is a must watch series for this Winter 2019 season. The above review was written when there was only three episodes. Now that we have episode 4, it's become apparent that they're not only doing the first LN, but the second and third ones as well (Boogiepop Returns: VS Imaginator Part 1 and Boogiepop Returns: VS Imaginator Part 2). VS Imaginator parts 1 and 2 begins a full month before the events of Others, but ends after the events of Others. The first three episodes are not related to episode 4 in any way. We're now at episode 14. Episode 14 begins the 5th LN of the series, Boogiepop Overdrive: The King of Distortion. Curiously, the anime has skipped the 4th book in the series, Boogiepop in the Mirror: Pandora, but we'll probably see that later. Physical copies of books 4 and 5 were never released outside of Japan individually - but they were included in the recent Boogiepop Omnibus Volume 2, which covers books 4-6. The timeline in this anime as of now is Boogiepop vs Imaginator (beginning) > Boogiepop & Others > Boogiepop Phantom > Boogiepop vs Imaginator (conclusion) > Boogiepop Overdrive. It's come to my attention that episodes 10-13 were released outside of this series' weekly streaming schedule, and as such, I didn't realize I've missed them. Boogiepop at Dawn is the 6th LN of the series, and is a prequel to the entire Boogiepop series. At Dawn is how everything started. How Miyashita became Boogiepop. How Kirima has come down with a God complex. Everything that you want to know about how the Boogiepop series started, it's all in episodes 10-13. I am what you can call... an Older anime fan.. not as old as some, but I cut my teeth on Robotech back in the days when it was on Toonami... in those days we fans didn't always have the internet, or if we did it was the old dial up variety, our bandwidth was measured in Kilobytes, not Gigs... Around those days... Okay closer to 16 years ago, on the channel lineups was an old network called Tech TV, who decided to play several different Anime series... usually ones that were more.... out there than the "hugely muscled guys flying around throwing the same 4 punches and 3 kicks at each other, while bragging about how cool they were" variety. Here is what Phantom appears to be trying to tell, and how it tells it... the first episode is essentially the Start of the story, and honestly the epilogue. as seen by the character who only witnesses the top of the story. the second episode is mainly going to be the genesis of the antagonist... each subsequent episode will be adding layers and layers and layers to the overall story. Much like in real life, when you walk down the street, every person you pass will have their own story, as to WHY they are walking down the street, going whatever way they are in relation to you, each story, links in with the others, to in the end provide a complete story. Will Boogiepop and Others require more than one viewing? Hell yeah. Is it worth it? Absolutely... in the end, if you are like me and have watched Phantom in the past, should you then re-watch it? Oh god yes... since that series starts with (spoiler alert) the Pillar of light... and after this series ends.... you KNOW what that means. Very Confusing, but I Dig It. I've watched the past two episodes and I'm confused as of right now, although I enjoy the experience I really do hope that in further episodes they do a bit more explaining, or at least enough so you can do your own interpretation of the series. Hopefully the quality keeps remaining the same and doesn't decline. Being an older anime fan, I have to say its nice to get back to something more 90's in narrative quality of being layered in a plot. The vibe is a lot like the first Boogiepop series or Lain where the viewer is in for a slow melancholy ride of existential feels. For Those Saying, "IMPOSSIBLE TO UNDERSTAND!" Just Relax and Enjoy. A story is supposed to have questions in it, it's supposed to lead you to a hallway and let you walk down it yourself, not shove you through (sorry that was a little dramatic). 1. "I don't know what's happening!" - You're not supposed to know yet, it'll get there, relax. 2. "I can't remember peoples names well." - Anytime significant plot is being told, they use names AND faces, any other time it's like bonus content for remembering. 3. "Everyone looks the same." - Yes, they use a realistic color pallet unlike most anime, but it really adds to the dramatic irony in 'normalcy.' Just pay a bit more attention to looks than normal. 4. "I have no idea when this is taking place on the timeline." - You're not supposed to know yet, it'll get there, relax. 5. "Who is the main character?" - Do I really have to explain how a show doesn't have to rely on one pinpointed, undoubted, protagonist? All in all this anime is GREAT so far, so different from a lot of hand-holdy shows too many people are used to. The world feels bulky and full of questions that don't always need answers. All you have to do is pay slightly more attention, and slightly is the keyword, than when watching something like Dragon Ball Z as it mansplains every plot point until you roll your eyes. Us weebs need a little wake-up call, make us use our brains for once! MADHOUSE delivers another brutal piece of entertainment. I'm going to be honest, I enjoy this show, BUTTTTTTTT I've got no clue how to explain the premise. It's one of those shows that shifts perspectives a lot, but everything is connected to everything else in some way. It delves into people with supernatural powers, strange creatures, and a high level of violence. It's well worth watching (like most MADHOUSE anime,) but expect to be confused, given that this isn't a casual viewing kind of show. "There is an urban legend that children tell one another about a shinigami that can release people from the pain they may be suffering. This "Angel of Death" has a name--Boogiepop"; this is all you know, but Boogie-Pop appears to be on your side, which is a good thing because she's so powerful and you're along for the ride; so you may as well lay back an enjoy it. The last Boogiepop anime aired back in 2000. We've had to wait 18 years for the new show. I for one, think it was well worth the wait, and that it's even better than the original. It's easily one of the most recognizable titles in anime, and I'm not surprised that all the more impatient people on CR don't like it, or feel like they can't understand it. Let's face it, for people who feel this way, Naruto or One Piece is probably more their speed. Boogiepop isn't hard to understand. But it won't make everything clear up front, nor will it tie up every loose end in the plot. It's one of those mysterious shows that prizes mystery and suspense, instead of a more casual kind of story-telling. You may have some questions that never get answered. The only way you might get an answer, is to also watch the older series. That's just how it is. The people who can't accept that probably don't have the attention span. Boogiepop and others is an adaptation of a light novel series that began in the 90s and it retains much of the flavor that made titles of that era so distinct. Much like Evangelion or Serial Experiments Lain, Boogiepop isn't afraid of doing its own thing, marching to its own drumbeat, even if that does lead to some people decrying it as being 'pretentious' or 'confusing.' Boogiepop provides the audience with all the answers we need as well as all the questions we should be asking. Boogiepop is dense in the same way a thick stew is. There is so much jammed into this series its wonderful. 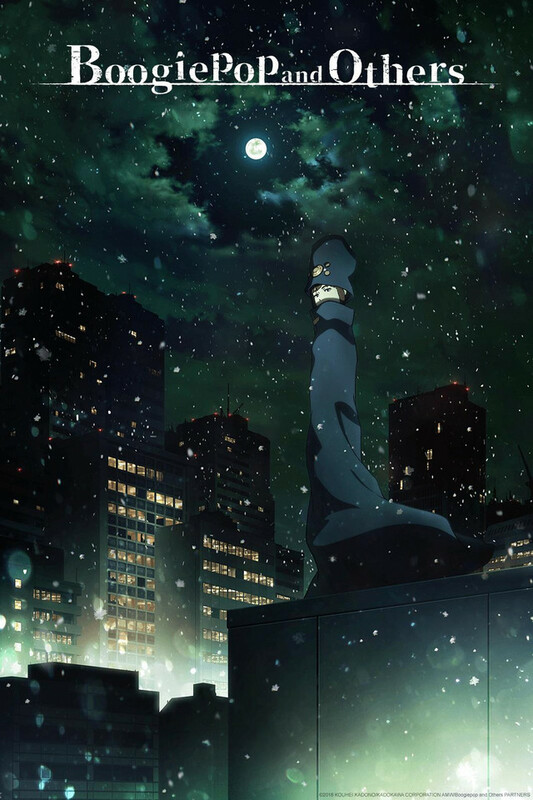 From the deep takes it has on modern society, to its flawed and nuanced characters, Boogiepop is an absolute treat to anyone willing to put in the time and effort to truly savor its complex flavor.